This convenient, spacious bag protects your ball mount from dirt, dust, and scratches. No longer will your ball mount roll around in your trunk or sit on the floor of your garage where it can easily get damaged. The bag also keeps dirty equipment contained to prevent grease and grime from getting in your car or truck.The wide, zippered opening extends from end to end for hassle-free packing and removal of your gear. 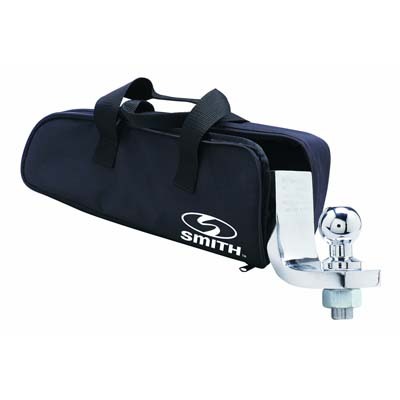 And the inner pocket is perfect for stashing your hitch pin and clip or hitch lock. Two sturdy handles on the top of the bag let you easily carry it in an upright position so that the contents remain level and minimally disturbed. Durable, 600-denier nylon construction means the bag is tough enough to hold your heavy-duty ball mount. And, it's easy to clean with a wet wash cloth or sponge. The sleek black case also has the CE Smith logo printed on the side. From Anonymous of Unionville, Missouri on 7/1/2016 . Good product. This is my second one. 1st lasted 15 yrs!